Practice for perfection !! 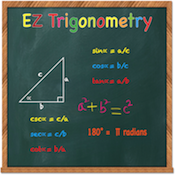 After the EZ-Geometry series of apps, Appzest Inc continues Let us Practice Educational apps series with this Trigonometry app. This app covers questions on basic trigonometry and is suited for students from grade 8 onwards. It covers 17 various Trigonometry related topics through a set of quiz on each topic ranging from the Pythagorean Theorem to various Trigonometric Identities . This app is NOT designed to teach the individual concepts. Rather this app is designed to provide students a platform to practice their skills with a huge database of question bank, all OFFLINE content. There are some pointers at the start of each quiz but essentially the app assumes that the student is already aware of the topic and ready to check their skills. Create your own user name (supports as many users as you wish) and take the practice tests. There is no Time constraint but a wrong answer has a score penalty. Provides a progress report for all completed chapters which can be emailed to Parents or as a copy to yourself. A cool Scratchpad (supports only free hand drawing) replaces the need for a pen and a paper. Please first try out this free version of the app before you get the full version, to ensure that it fits your purpose and helps your child with copious and offline practice material.